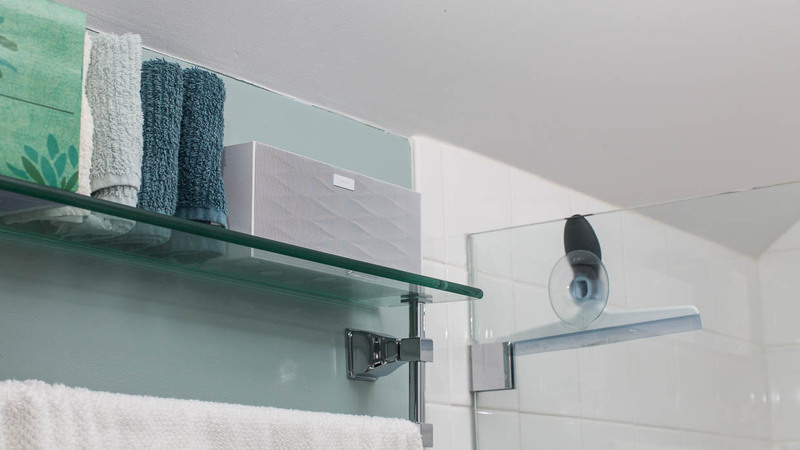 It’s great for bathroom use: it’s small, loud, wireless via Bluetooth, and battery-powered, so you don’t need to plug it into the precious few outlets that most bathrooms have. And running a wire across the bathrom would almost certainly be met with a spousal veto. The original Jambox, while it’s a delightful product otherwise, has two major flaws for this use. It vibrates so much with bassy songs at high volumes that it can easily vibrate itself off the edge of whatever it’s sitting on. (Fortunately, it’s also very durable.) And while it’s impressively loud for its size, it can’t get loud enough for spoken podcasts to be heard consistently clearly in a noisy shower. I first tried and didn’t like the Bose SoundLink to address those shortcomings. Then I tried the Big Jambox, and I’m glad I did. Left to right: Bose SoundLink, Big Jambox in white (pardon the Moiré), and original Jambox in black (pardon its perma-dust coating). Both Jamboxes come in other colors as well. It also has dramatically better battery life. I thought the original Jambox had great battery life: under my typical use of 15–30 minutes per day of high-volume podcast or music playback over Bluetooth, the original Jambox lasted about 10 days. The Big Jambox lasts about a month in the same use. Big Jambox in its natural habitat next to the shower. But it’s also much less portable. The original Jambox can easily be carried around in most laptop bags. The Big Jambox will fit (awkwardly) into bigger bags, but it doesn’t just look like a brick: it’s noticeably dense, and therefore quite heavy for its size. It’s “portable” the same way 17” laptops are portable: you can bring it with you, but you won’t want it on your shoulder. Neither Jambox sounds great while playing music, but I have high standards for “great” sound quality that have never been met by any Bluetooth, AirPlay, or Dock-port speakers. I’d say the sound quality from the original Jambox is what you’d expect if a 15” MacBook Pro’s speakers could get much louder, and the sound quality (and maximum volume) of the Big Jambox is comparable to most midrange AC-powered iPod/iPhone speaker docks. Both Jamboxes achieve volume levels that are surprisingly high for battery-powered speakers, especially given their sizes. Both sound great while playing podcasts, but the Big Jambox sounds better. And if you want to listen to podcasts in the shower, you’ll probably need the Big’s higher volume. The Jamboxes’ design is polarizing. Most audio products that come from the computer industry’s vicinity (anything with Bluetooth, Wi-Fi, or a Dock connector) look hideous, tacky, and cheap.1 Or, like the Bose SoundLink, like it came from a SkyMall catalog in 1997. Personally, I think the Big Jambox, in white (and only in white), is better-looking than any other useful Bluetooth or AirPlay speaker I’ve seen. Both Jamboxes feel like very high-quality products. They both come with a full set of power and audio cables, and they’re filled with nice little touches, including the tasteful-yet-cool startup and pairing sounds. The Bluetooth interface on both is rock-solid — it’s much more reliable, and much less buggy on iOS devices, than the AirPlay speaker in my kitchen. If you’ll usually have the same device sending audio to a speaker, and it’ll always be within about 15 feet, I highly recommend Bluetooth over AirPlay. And the Big Jambox is the best Bluetooth speaker that I’ve found. I strongly recommend the Big Jambox, as long as you don’t need to carry it around very often. I can also recommend the original Jambox, but with hesitation: it’s only the better choice if the price difference or portability are most important to you.